Figure 3. 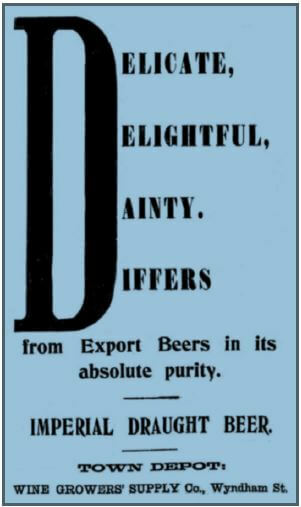 Imperial Brewery ad. China Mail, 24 January 1908, p.5. The Image on the Home Page, not from Martyn’s article, was kindly sent by IDJ and shows the Imperial Brewery in 1905. 30. Colonial Reports Annual No 570 Hong Kong Report for 1907. HMSO (1908) p.11. 31. Wright, A. (1908) Twentieth century impressions of Hongkong, Shanghai, and other treaty ports of China: their history, people, commerce, industries, and resources, Volume 1. London: Lloyds Greater Britain Publishing Co. p.249. 32. Chamber of Commerce Journal, London Chamber of Commerce. (1908) Vol. 27, June. p.179. 33. Berichte Der K Und K Österreich-Ungarische Konsularämter über das Jahr 1907 Herausgegeben im Auftrage Des K K Handelsministeriums Vom K K Österreiches Handelsmuseum. Section IV, pp.6 & 9. Translated M. Cornell. This article was first posted on 8th March 2016.